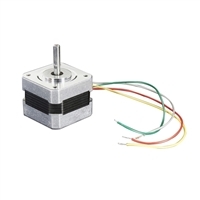 A stepper motor to satisfy all your robotics needs! This 4-wire bipolar stepper has 1.8 per step for smooth motion and a nice holding torque. The motor was specified to have a max current of 350mA so that it could be driven easily with an Adafruit motor shield for Arduino (or other motor driver) and a wall adapter or lead-acid battery.